To mark Rare Disease Day on February 28, CARIS has posted an updated table on genetic and syndromic rare diseases in Wales on its website. Results from the UK-wide confidential enquiry into the management of Congenital Diaphragmatic Hernia are released. The trustees of Newlife Foundation are pleased to invite UK based research applications. The closing date for Full Grants is 5pm Friday 5th December 2014. Applications for Start Up Grants are welcome anytime until 5pm Friday 20th February 2015. A simple blood test during pregnancy which can detect Down's syndrome in the developing fetus is to be trialled by the NHS. It could significantly reduce the number of women needed invasive testing, which can cause miscarriage. Click on the title above for the link to the full BBC news story. BINOCAR has launched the third annual surveillance report using data from six regional registers and two disease specific registers for 2011. Click on the title above for a link to the report, executive summary and press release and for the media coverage of this report. New research, published in The Lancet, highlights important information for health professionals and parents about the factors which may increase the likelihood of a baby being born with a birth defect. Click on the title above for the link to the full press release and journal article. Too many babies born with a cleft palate are being diagnosed late, causing unnecessary distress, the Royal College of Surgeons says. Click on the title above for the link to the full BBC news article and the CRANE report. BINOCAR has launched the second annual surveillance report using data from six regional registers and two disease specific registers for 2010. Click on the title above for a link to the report, executive summary and press release and for the media coverage of this report. All babies should be screened at birth for heart defects using a cheap simple test that will pick up three out of four affected infants. Click on the title above for the link to the full Daily Mail news story. An investigation has been called after five babies in the same street in Kent were found to have the same rare birth defect, gastroschisis. Click on the title above for the link to the full BBC news story. The paper using NorCAS data entitled 'Peri-conception hyperglycaemia and nephropathy are associated with risk of congenital anomaly in women with pre-existing diabetes: a population-based cohort study' has been published in the February issue of the journal Diabetologia. BINOCAR has launched the first annual surveillance report using data from five regional registers and two disease specific registers for 2009. Click on the title above for a link to the report, executive summary and press release and for the media coverage of this report. 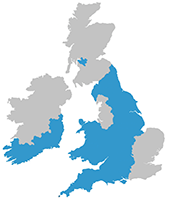 HQIP has agreed to fund BINOCAR for one year to carry out congenital anomaly surveillance for those areas covered by regional registers for England and Wales. The statistics published for 2008 are the last in an annual series dating back over forty years. BINOCAR has released a press statement with respect to the Chief Medical Officer's annual report that reported an almost two-fold increase in the number of births of babies with the gastroschisis in England and Wales over the past 10 years. BINOCAR has released a press statement with respect to the 'Week In Week Out' programme that was screened on BBC Wales on Tuesday 5 October 2004.